Craggy and impressive, Seneca Rocks is a large needle of rock that towers over the surrounding wooded landscape of the Seneca Rocks National Recreational Area in Pendleton Country, West Virginia. The rocks are composed of vertically layered quartzite with deep vertical cracks that provide an irresistible lure for rock climbers and were used as a training ground for the U.S. Mountain Forces during WWII. You can take a course in basic or advanced rock climbing techniques at the Seneca Rocks Climbing School if you are new to the sport. 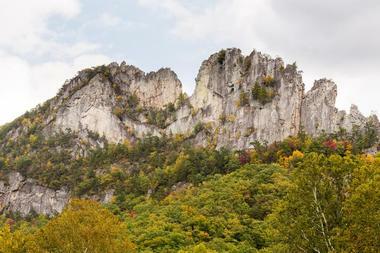 If summiting Seneca Rocks seems too much like hard work, you can enjoy the remarkable views and scenery by hiking the moderately easy Seneca Rocks Trail to the base of the needle. There is a good visitors center and campground nearby. Reaching 4,863 feet above sea level, Spruce Knob is the summit of Spruce Mountain and the highest point in West Virginia. Surprisingly, you do not have to be a rock climber or even don hiking boots to enjoy the privilege of seeing the views from this highpoint – the summit of Spruce Knob can be reached by driving up a good mountain road and then taking a short walk to the observation tower. If you prefer to explore the area on foot, you can choose from the Huckleberry Trail, the Seneca Creek Trail, or the Lumberjack Trail to reach the summit. Camping enthusiasts can set up camp at Seneca Shadows Campground or Big Ben Camp Ground to spend a few days exploring the area. Bear Rocks are one of the most frequently photographed landmarks in West Virginia and can be found in the Bear Rocks Preserve in the north of the Dolly Sods Wilderness. The area surrounding Bear Rock is particularly scenic and the entire surrounding wilderness area is the most popular hiking area in West Virginia. 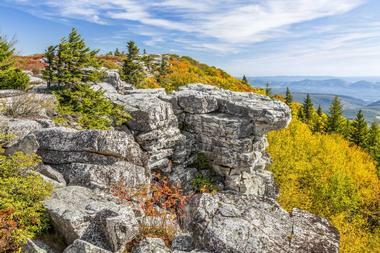 Hikers can explore the natural beauty of the area along the 2.4-mile (easy) Bear Rocks Trail or venture further south, where there are several hiking trails in the Dolly Sods Wilderness. You can expect to see plenty of unusual flora and fauna along the route, while several established and backcountry campsites dot the trails. The close proximity of the Highland Scenic Highway means that you have very easy access to hike or climb Red Spruce Knob, one of the highest peaks of the Allegheny Mountains in West Virginia. 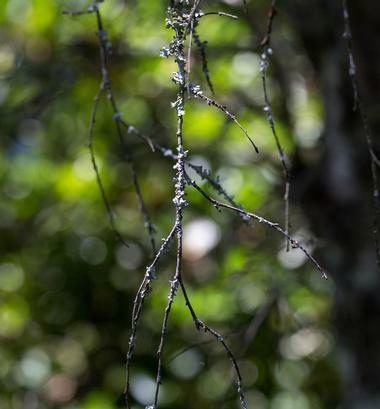 The Red Spruce Knob trails will lead hikers though some very attractive wooded scenery, which is home to many bird varieties as well as to the endangered Virginia flying squirrel. You can hike the trail all year round and in winter you can try some forest skiing. Visitors who would like to spend a few days in the area can set up camp at the Tea Creek or Day Run campsites or try some primitive backcountry camping. Bickle Knob is yet another of West Virginia’s many 4,000+ foot peaks, which occupies a tall ridge overlooking the Otter Creek Wilderness in the Monongahela National Forest. Good news for non-hikers is that you can access the peak by road along Forest Service Road (91A) and then take a short walk up to the observation tower, which was once used as a fire look-out point. If you prefer to hike you can set off along the 5.2-mile Middle Point Trail. Hikers who prefer a more challenging day out can choose between several other Otter Creek Wilderness trails that require a bit of route-finding skills. The entire area is a popular destination for outdoor enthusiasts and there are several options for camping, including RV campsites and primitive backcountry camping opportunities. Rose Benchmark marks the highest spot in Braxton County, West Virginia, topping out at 2,183 feet, which gives it the distinction of being the 28th highest point in the state and puts it on the radar of all the West Virginia Peak Chasers. Unfortunately, the area is a hive of activity due to the number of encroaching oil/gas wells, which means that it is not a particularly attractive area to go hiking. If you happen to want to add Rose Benchmark to the list of peaks you have conquered, you can easily access the highpoint by car along Crites Mountain Road, close to the small town of Birch River. Once you have bagged your peak, you can visit nearby Summersville Lake for camping, hiking, and boating activities. Fifty miles long and over 5 miles wide at places, Cheat Mountain is an extremely high and rugged mountain in the eastern part of West Virginia. Until the logging industry stripped the mountain of its splendid forests, Cheat Mountain supported the largest red spruce forest south of Maine, but by 1960 it had been largely stripped bare. In 1960, Cass Scenic Railroad State Park was established to protect the area and re-forestation has been an ongoing project. Today you can take the scenic railway all the way to Bald Knob at the top of Cheat Mountain to admire the impressive views from the summit. Hikers can explore along the Cheat Mountain Ridge Trail, which is also good for snowshoeing in winter. Running almost parallel to the massive Cheat Mountain, the Back Allegheny Mountain is also a very large mountain whose summit at Bald Knob reaches an elevation of 4,843 feet above sea level. Protected by the Monongahela National Forest, Back Allegheny Mountain lies in an environmentally sensitive area of large red spruce forests that are home to a wide variety of birds and wildlife. A short (but very steep) half-mile hike along the Bald Knob Trail will take you to the summit (for one of the best spots in West Virginia to watch a mountain sunset). Five miles south of Bald Knob you can go skiing at the Snowshoe Ski Resort, and the greater Monongahela National Forest offers a very wide range of outdoor activities, including hiking, climbing, fishing, camping, and much more. Mount Port Crayon is the sixth-highest peak in West Virginia, located in the Roaring Plains Wilderness of the Monongahela National Forest. Peak Chasers will need plenty of determination to summit Mount Port Crayon, which is one of the most inaccessible highpoints in the state. To reach the summit, you need to negotiate a very steep 5-mile trail that includes long stretches of pure off-trail bushwhacking. 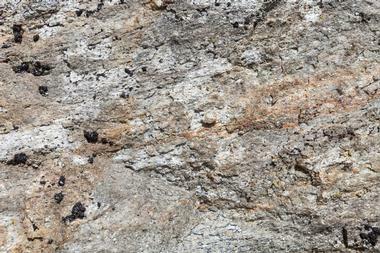 It is a great challenge for experienced hikers/scramblers, but should not be attempted by novices. Less experienced hikers, walkers, and bird watchers will find a variety of easier scenic trails in the greater Monongahela National Forest. North Fork Mountain is located in the “High Alleghenies” of eastern West Virginia. North Fork’s highest peak is Kile Knob at 4,588 feet, and there are a further three lofty peaks, Panther Knob, Chimney Top, and Pike Knob, which are nearly as high and will interest all the Peak Chasers out there. The 24-mile North Fork Mountain Trail is widely acknowledged to be one of the most scenic high-elevation trails in the state, and worthy of a place on any hiking enthusiast’s wish-list. The views in all directions are pretty amazing as you make your way to the various highpoints, and the trail is also suitable for energetic mountain bikers, trail runners, and backcountry campers. Allegheny Mountain is one of the best-known mountain ridges in the Allegheny Mountain Range, which forms part of the Appalachian Mountains on the Virginia/West Virginia state line. You will find no less than 14 peaks along this ridge, the tallest of which is Paddy Knob at 4,477 feet. A large part of the surrounding area is called the Paddy Knob Special Biological Area, and is home to many rare and/or endangered bird species, such as the bald eagle and mourning warbler. The area is remote and undeveloped – a paradise for hikers and wildlife watchers who enjoy solitude. The challenging Paddy Knob Trail, which climbs over 2,300 feet, will take you to the highest point on the ridge, while less adventurous hikers can find many easier trails in the nearby Monongahela National Forest. Shavers Mountain is another of West Virginia’s towering mountain ridges in the Allegheny Range in eastern West Virginia. Shavers Mountain is really special as it lies between exceptionally scenic natural wilderness areas – the Otter Creek Wilderness and the Gaudineer Scenic Area, both of which offer outdoor enthusiasts a wide range of hiking trails. The highest point on Shavers Mountain is Gaudineer Knob (4,460 feet), which is accessible by car along Forest Service Road 27A; there is a picnic site and toilets at the summit. Hikers can explore many very scenic trails in the area, including the High Falls Trail, while campers can pitch their tent at Shavers Fork Campground or enjoy trail-side backcountry camping. Running for 73 miles along the border of Virginia and West Virginia in the George Washington National Forest, Shenandoah Mountain forms the eastern-most part of the Allegheny Mountain Range. Shenandoah Mountain has three notable peaks, namely Reddish Knob (4,387 feet), Flagpole Knob (4,383 feet), and Bald Knob (3,680 feet), all of which beckon ardent Peak Baggers, while the entire area is very popular for hiking, mountain biking, trail running, and camping. 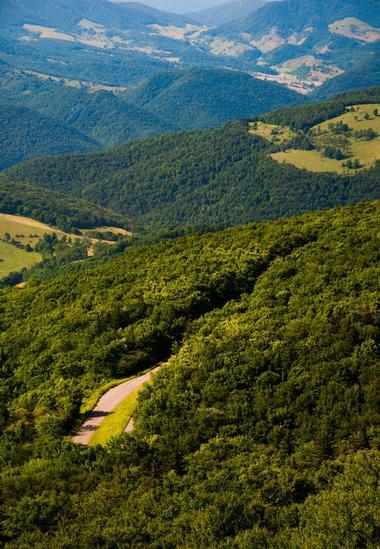 You can reach the summit of Reddish Knob by mountain bike along an asphalt road or hike to the peak for amazing 360-degree views of the Shenandoah Valley. There are many campsites in the valley and a multitude of hiking trails, including a section of the famous Appalachian Trail. 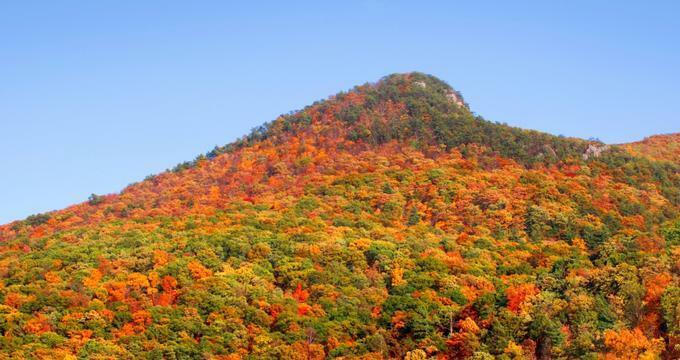 Backbone Mountain is located in the central Appalachian Mountain Range, running 39 miles from West Virginia to Maryland, where the peak of the mountain at Hoye-Crest (3,360 feet) is the highest spot in Maryland. On the West Virginia side of the mountain you will find the beautiful Blackwater Falls State Park, which offers hikers and mountain bikers an extensive network of trails along which you can explore Backbone Mountain. You can rent a cabin or pitch your tent at the campground and spend a few days enjoying a wide variety of outdoor activities, including nature walks, bird-watching, hiking, biking, fishing, and ranger-led interpretive programs for all ages. Castle Mountain is an elevated ridge running between the north and south branches of the Potomac River in Pendleton County, West Virginia, just over 7 miles from Spruce Knob, which is the highest peak in West Virginia. Castle Mountain reaches a very respectable elevation of 3,410 feet and a hike to the summit will reward you with extensive views of the surrounding landscape and Spruce Knob to the north. To thoroughly explore this beautiful forested mountain area, you can set up camp at Seneca Shadows Campground or Big Ben Campground and spend some quality time enjoying nature in the heart of the West Virginia Appalachians. Located west of the famous Shenandoah Valley and east of the Allegheny Mountains, the Great North Mountain forms a 50-mile border between Virginia and West Virginia. Part of Great North Mountain falls within the beautiful George Washington National Forest, which offers outdoor enthusiasts a veritable playground in which to enjoy hiking, mountain biking, hunting, and wildlife watching. You can explore an extensive network of trails, including part of the Tuscarora/Blue Ridge Trail, the Seven Springs Trail, and several others that lead to the impressive Big Schloss peak. Campers will find several free campsites along the trails and backcountry camping is also available. Forming part of the Allegheny Mountains, Laurel Mountain (or Laurel Hill) is a meandering 32-mile ridge that runs between the Cheat River and the Tygart River Valley in the Ridge-and-Valley region of West Virginia. Outdoor enthusiasts who prefer solitude will be pleased to know that the Laurel Fork North and South Wilderness areas are both relatively lightly trafficked and are perfectly suited to backpacking and backcountry camping. The area offers over 19 miles of trails to explore and you can enjoy beautiful scenery, swimming holes, fishing, and bird-watching along the route. If you happen to be a West Virginia Peak Bagger, you can add the Elliot Benchmark peak (3,157 feet) to your list of conquests. New Creek Mountain is another of West Virginia’s long mountain ridges that are part of the Ridge-and-Valley Appalachian range. New Creek Mountain reaches an elevation of 3,084 feet and beckons hikers and scramblers to come and explore both Saddle Mountain (a saddle-shaped depression in the ridge that is best viewed from the nearby town of Skyline) and the very impressive New Creek Mountain Cliffs. If you are not up for taking on the challenge of hiking up to the rims of the very steep triangular gorge at New Creek Mountain Cliffs, you can take a scenic drive along the paved country road that follows the banks of Patterson Creek. Located in the Nathaniel Mountain Wildlife Management Area of West Virginia, South Branch Mountain is one of the most prominent ridges in this mountainous area. The highest point along the ridge rises to 3,028 feet above sea level, and you can explore the area by means of a scenic drive along the Northwestern Turnpike in the Sunrise Summit Area. The Wildlife Management Area is heavily wooded and offers a network of interesting hiking trails and opportunities for wildlife watching, hunting, trout fishing, swimming, kayaking, and camping. Part of the famous Appalachian National Scenic Trail is located to the east of South Branch Mountain if you are looking for a more challenging hiking experience. Named by German settlers for its resemblance to a castle, Big Schloss is a prominent rocky peak in the Great North Mountain range of the Appalachians. The mountain is located right on the border between Virginia and West Virginia and offers hiking enthusiasts a selection of trails to reach the peak. 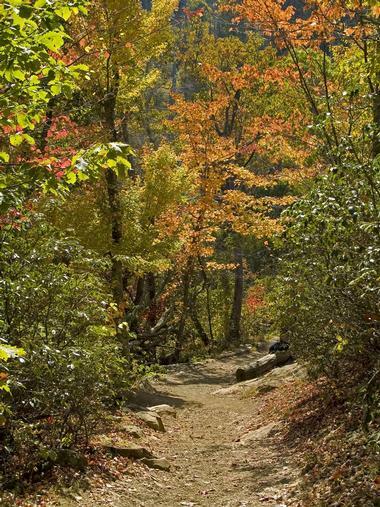 The most popular route to the summit is via the 4-mile Mill Mountain Trail from Wolf Gap. It is considered a moderate route and will reward you will wonderful views from the summit, which is reached via a wooden bridge. You can set up camp at the Wolf Gap Campground or bring along your tent and enjoy a night of backcountry camping near the summit. Nestled in the heart of the Nathaniel Mountain Wildlife Management Area of West Virginia, Nathaniel Mountain reaches an elevation of 2,739 feet and is one of three prominent ridges in this heavily wooded undulating landscape. The area surrounding the mountain offers a wide diversity of activities for outdoor enthusiasts – you can spend your time walking or hiking along a variety of trails or enjoy some excellent bird watching at the two wetlands, which are pretty unique at such a high altitude. 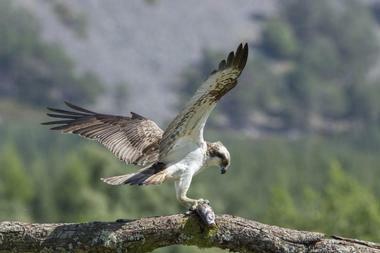 Other activities include swimming, trout fishing, kayaking, hunting, mountain biking, and trail running. You can try primitive camping inside the Wildlife Management Area or bring your tent or RV to the nearby Wapocoma Campground. 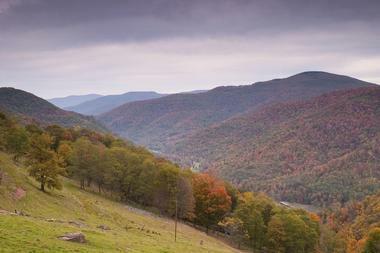 Forming the border between Mineral and Hampshire counties in West Virginia, Patterson Creek Mountain is a long undulating ridge flanked by Patterson Creek. The highest point along the ridge is Charles Knob at 2,723 feet, and in addition there are several more peaks waiting to be conquered. The Patterson Creek Trail System is popular with hikers, mountain bikers, and even trail runners and attracts a number of annual mountain bike events and marathons. The adjacent Patterson Creek offers a variety of water activities, including swimming, trout fishing, canoeing, kayaking, and tube-floating and there are good opportunities for backcountry camping and wildlife watching as well as several serviced campgrounds in close proximity. Although Mill Creek Mountain is by no means one of the tallest mountains in West Virginia, this long and undulating mountain ridge, which forms part of the Ridge-and-Valley Appalachians, is certainly worth exploring. You can take on the tallest 2,650-foot summit at High Knob or opt to hike along the ridge and explore some of the other 12 interesting summits. Visitors to the area should make a point of visiting Hanging Rocks, a perpendicular series of sandstone cliffs which rise almost 300 feet above the South Branch Potomac River, which has carved a gap right through Mill Creek Mountain. Outdoor activities include hiking, mountain biking, wildlife watching, and camping. Running northwest through Hampshire and Morgan counties in the Eastern Panhandle area of West Virginia, Cacapon Mountain reaches a height of 2,618 feet. A large portion of the scenic mountain lies within Cacapon Resort State Park, which you can use as a base for exploring the area – the resort offers cabins and bungalows as well as an inn. There is a 20-mile network of trails within the confines of the state park, varying from gentle nature walks to strenuous hikes and non-hikers can enjoy fishing, horseback riding, boating, swimming, and mountain biking. The scenic Panorama Overlook (off West Virginia Route 9) at the northern end of Cacapon Mountain is definitely worth a visit to admire the views out over three states and the confluence of the Potomac and Cacapon rivers. 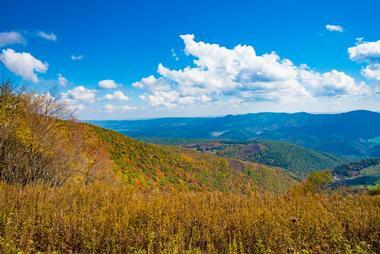 Forming part of the Ridge-and-Valley Appalachians in the Eastern Panhandle, Sleepy Creek Mountain and Third Hill Mountain form a blind valley that is home to Sleepy Creek Lake and the Sleepy Creek Wildlife Management Area. Outdoor enthusiasts can set up a basecamp at one of the primitive camping sites in the wildlife area and spend a few days exploring all the outdoor activities on offer, which include hiking, walking, hunting and trapping, wildlife watching, and fishing. 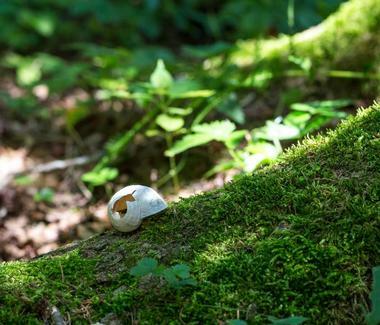 Hiking enthusiasts and backpackers can set off along the 14.6-mile Tuscarora Trail from Sleepy Creek Lake and spend a night or two enjoying backcountry camping en route.